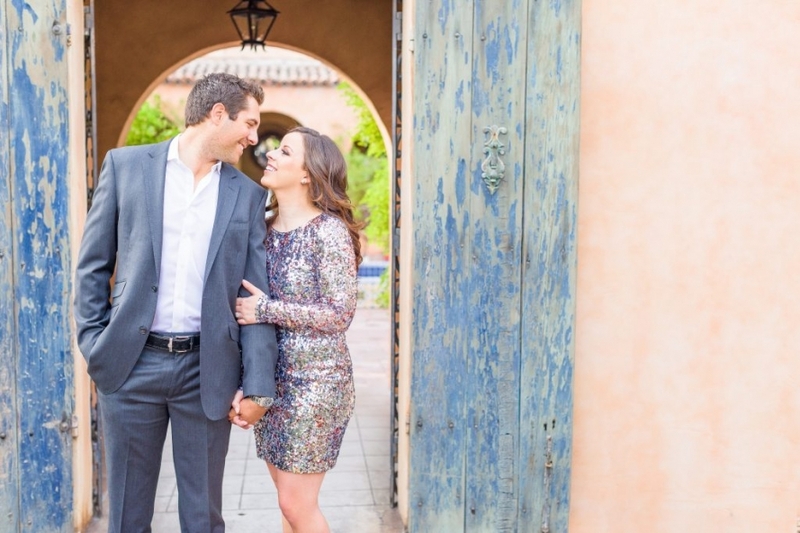 Your engagement photos will be treasured just as much as your wedding photos, so go all out! How many chances do you get to dress to the nines together with a personal paparazzi at your disposal? One day when you’re hair is grey you will look back at these photos, these special moments when you weren’t yet married and just young and in love. These times deserve to be preserved in the best possible way. Ladies: Heels and dresses make your legs look killer, and accessories just add pop to your gorgeous outfit. Keep reading for tips on hair and makeup! Guys: Leather watches, belts, and shoes make you look like a million bucks! Tip: Ladies, add a little whimsy to your photos by wearing a custom headpiece by your wedding florist! It adds such a gorgeous potto your images! In fact, I discourage it! Let your personalities shine in your own individual ways! If you are able to tie together your outfits with subtleties, more power to you! Wearing different colors and patterns also ads dimension to your photos. This gives you a chance to reflect your wedding theme by using color! If there’s cool weather, definitely layer it up. Scarves, cardigans, and jackets can also add so much fun to your outfit if you’re going for that cozy look. This adds depth to your photos and makes you pop from a blurry background. Patterns keep your photos from looking flat; even a textured laces or florals make all the difference! This is probably the biggest tip I can give. Just as you want to be sure to dress for the occasion, I know you ladies want to look your best as well. For this reason I HIGHLY suggest having your hair and makeup profesionally done. Hear me out; you are already investing so much time and care into your engagement session, and how many times in your life will you have the opportunity to be pampered by a beauty proffesional? Again, besides your wedding photos, these are it! These people were trained to enhance your natural beauty and give you a confident glow for your session. It also gives you a chance to have a “practice round” with your hair/makeup artist(s) who will be primping you for the big day. Wear a little more makeup than you normally would, and a little fancier hair. As materialistic as it may sound, the camera can actually wash out your face, similiar to stage lights on a performer. It really does make a difference in making your eyes and lips pop by going a little darker. Just as your photos will be consistent with your wedding, your look will be too. Worth. Every. Penny. Most of the time, your engagement photos will grace your wedding’s centerpieces, sign-in table, and Save the Date’s, so you want your photos to match your theme and feel of your wedding. Your vision for your big day will be enhanced if you consider that these photos will be present, plus it gives your guests a preview of what’s to come when they receive your invite! For example, if your colors are blush and navy, alternate your outfits with those colors to bring a subtle touch of your vision to life! Our blush desert mountains are also a wonderful way of tying in that lovely color! I know. You grew up surrounded by more prickly pears than trees. Your home is scorpion proofed. Tumbleweeds are a thing. If you were born and raised here like I was, you want nothing to do with the desert. I totally get it. But you guys, the desert can be absolutely beautiful. The soft pinks and tans of the mountains make your skin tones oh so soft and gorgeous. The gravel actually reflects back onto your face in a much more flattering way than grass ever will in a million years. The light is golden and glowy and there is nothing like it. Trust me when I say, from a photographer’s perspective, the desert is a more gorgeous backdrop than you will ever know. 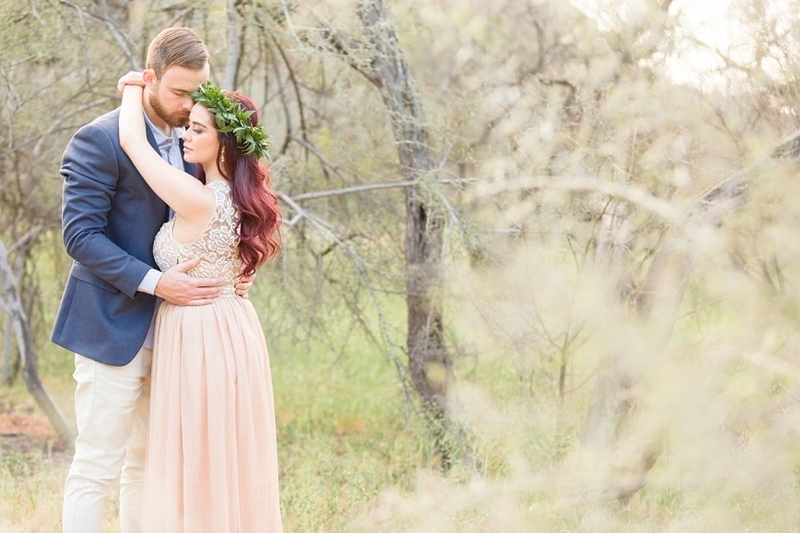 If you are still anti-desert and you envisioned a certain look for your photos, such as a green, “forresty” feel, it is completely possible to accomplish! Those locations normally just don’t exist here in Pheonix, and if they do, they usually require an appointment and a fee. If you still want rolling hills and mountains, just be willing to take a road trip with yours truely! And prepare to snack hard in the car… We are lucky enough to live about 3 hours form pine trees and snow, just know that this can be an all-day event! If you’re willing to devote extra time and money to travel for your session, expect some magical photos! Yep, I just said that. I saved the hardest tip for last, but I do want you to ditch your wedding lifeline for a couple of days before your session. Now that I’ve struck a chord, you’re about to cringe even more from what I have to say… But hear me out on this one! Pinterest is a magical, beautiful land full of dreamy weddings in front of the Eiffel Tower with a bride coming down the isle on a horse with a flower crown. Your Pinterest board is a collection of the best-of-the-best photos of weddings and engagement sessions that were either styled (not a real wedding, but put together to showcase vendors) or hundreds of thousands of dollars. It’s so unfair to compare your wedding to these, because your wedding should be unique to how you want your love story to be told. The same goes for your engagements photos. If you try to recreate someone’s location or poses, it’s not staying true to who you are as a couple. Don’t let someone else’s incredible location stifle the excitement and personal creativity of what your session could be. Of course, getting ideas is always welcomed, but try not to live and die by what you saw in someone else’s special moment. I heard it best from two of my mentors when they said, “Comparison is the thief of joy.” (That being said, I love Pinterest way too much and will be an obsessive pinner for life. *Bonus Tip: Take your ring to your jeweler and have it cleaned (usually for free)! When you’re at the mall looking for outfits, drop it off while you shop. It will add that extra sparkle that you’ll love! Lastly, amidst all the planning and and prepping for your session, remember to take time and enjoy these moments before your I-do’s. They are so special and taking these photos is one of the most exciting things to do while planning your wedding. Most of all, have fun lovebirds!